This is a delicious elegant dish. At its heart are sautéed broccoli and onions with Mediterranean herbs. 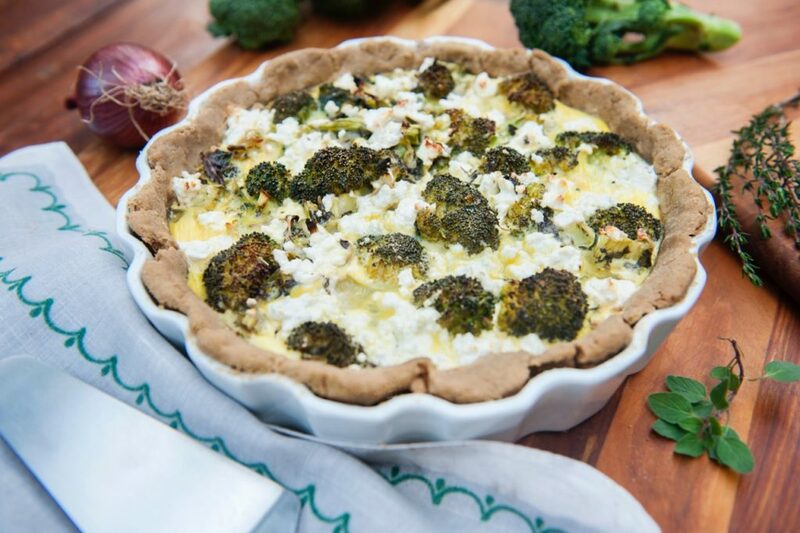 Baked slowly with eggs and feta for a perfect main course. Delightful served hot for dinner as well as cold for a picnic lunch. Preheat the oven to 350 degrees. Spread 1 tablespoon ghee on a 10 inch pie pan. Combine the teff flour, ½ cup ghee, water, and sea salt in a medium size bowl and stir until well combined. Transfer the dough to the prepared pie pan and use your fingers to press it out in an even layer over the bottom and sides of the pan. Poke a few holes in the bottom with a fork. Bake for 10 minutes, until it loses it shine. While the pie crust is baking, make the filling. Melt the ghee in a large saucepan over medium heat. Add the onions, salt and pepper and saute for 3-5 minutes until onions softens. Stir in the broccoli stems and saute for 3 minutes until they turn bright green. Stir in the broccoli florets and saute for 3 minutes until they turn bright green. Turn off the heat. Stir in basil, oregano and thyme. 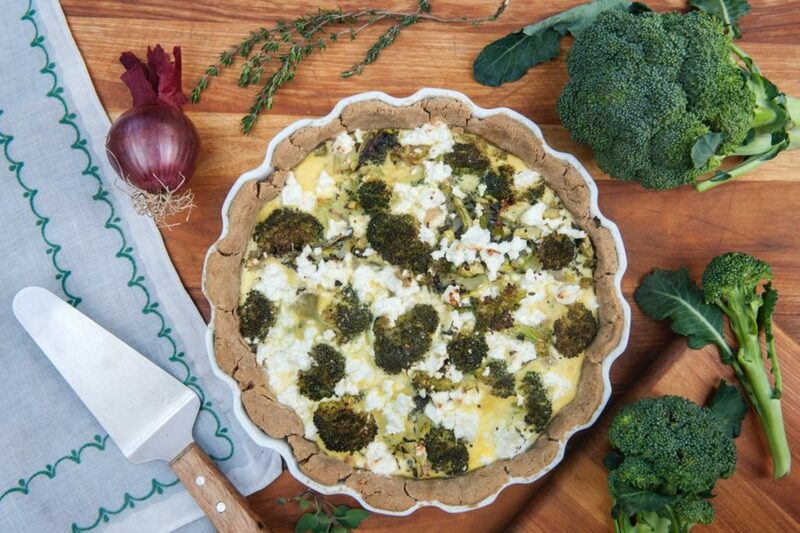 Pour the broccoli and onion mixture into the baked pie crust. Top with feta and eggs. Bake for 50-60 minutes, or until the eggs are set. Let the pie cool for about 15-20 minutes before slicing. Recipe Copyright © 2017 Leslie Cerier. All Rights Reserved to Leslie Cerier.